Last week I had the honor of attending my niece’s wedding. It was gorgeous, the bride was beautiful, the groom was wonderful… All in all a fabulous time was had by all and I got to help! The groom had already gone and picked out rings- which were very lovely- but I had the pleasure of designing and creating a custom pendant just for my niece. My niece has a very interesting style personality. Traditional, elegant, a true Lady, but with unexpected ripples of modern twists and quirks. 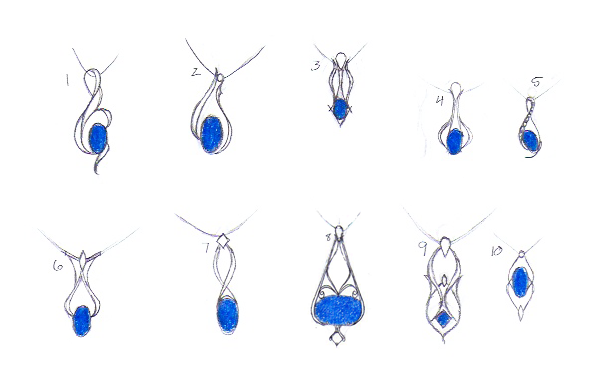 So when I offered to design a pendant for her, I have to admit, I was a little nervous. How would I balance all of these aspects in a single design? Keep in mind, the proposed scale of these pendants is actually quite small. Number 8 is no more than 11mm wide, with the total height of each of the pendants being approximately 1.5 inches tall. By this point, I’d seen her stunningly gorgeous dress. Lace sleeves, sweetheart neckline, full train- the works. Her dress has the timeless elegance of every classic design from the turn of the last century. So my designs were leaning in Edwardian directions, while still trying to incorporate the simple fluid lines my niece favors. She loved number 3 and number 5, with an emphasis on number 5, and left the details completely up to my artistic judgement. So I set out to turn a two dimensional sketch into a three dimensional art piece of elegant adornment. First stop- my gemstones. I’d ordered several blue topazes for the custom Christmas Pendant I made last November, and had several to choose from for this pendant. But I ran into trouble with the graduated swirl of stones down the side. My original plan was to use sapphires, but I just didn’t like the sapphires next to the topaz. Something to do with the disparate tones of blue. Never one to stand in the way of design, I reached for the blue diamonds instead, which coordinated beautifully, as always. I really really love blue diamonds and use them any time I can, just in case anyone’s curious. As I built the pendant I kept thinking about what it means to be married. How you have to be flexible, and flow with the situation. So I forged the pendant into a flow of silver, framing the gemstones. I thought about how you have to work together as a team to make everything work, and created a unique setting with two prongs holding the single blue topaz. Finally, I thought about how two lives are brought together, and forged into one cohesive whole, and selectively polished the forged highlights of my creation, to emphasize the forging. My niece was thrilled, and I couldn’t be happier. Congratulations to my lovely niece and her wonderful new husband! I am trying to find the perfect bride gift, from the maid of honor/sister, this could be my blue. how much? I don’t have a lot of money but want to give my best friend/baby sister the world!! Hi Krystal! Thank you for your lovely comment. This pendant is a custom design specifically for my niece, and when I do custom designs, I don’t repeat them. It’s my firm belief that every person I create for deserves a unique design that is their very own. However, I would be extremely happy to design you something very similar. Pendants like these mean alot to me, as an artist. I’m also very capable of working within whatever budget you may have. I can’t give you a specific quote without talking about the specifics of your design, but I can give you a ballpark idea of how I work to a budget. For example: I made a pendant in 18k gold, sterling silver and citrine, which is $450. One of my clients told me how much she really loved it, but her budget just didn’t allow for that pendant. So I made an extremely similar pendant… for $40. She was thoroughly excited and has a custom design of her very own. If you’d like to talk to me about a custom design for your sister, my email is kaelinatkaelindesigndotcom, please insert the appropriate email symbols! 🙂 I’m certain I can make something you will love within your budget. Thanks again for commenting!